NEW BRITAIN – Borinquen Bakery was recognized as the Minority Owned Small Business of the Year by the Small Business Administration earlier this month. Michelle Koehler, of the Small Business Development Center, nominated Borinquen Bakery to receive the award. Mary Ortiz, the owner of the bakery, said she was glad to receive the nomination, but winning, was a surprise. “It was an honor and a privilege for me to be recognized for my job and to be nominated to this award,” Ortiz said. 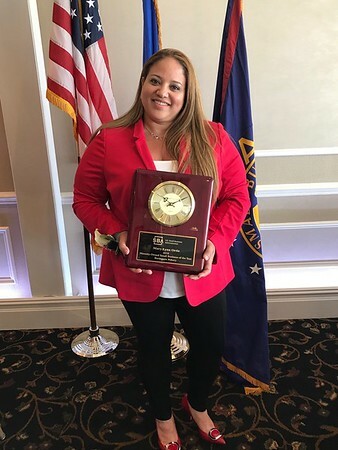 The award was given to Ortiz in a ceremony that took place at Anthony’s Ocean View in New Haven. Ortiz said that there were about 10 other businesses nominated along with hers to receive award. U.S. Rep. Elizabeth Esty congratulated Ortiz for her award on Twitter, and said she will tell her colleagues in Washington about the “incredible” food offered at Borinquen. Borinquen Bakery, now located at 610 Arch St., was started by Ortiz in 2001 at the business’s previous location on 296 Arch St.
Ortiz said her father inspired her to open her own business. He has a bakery in Hartford that he opened in 1996 called Sol De Boriquen. However, she saw the need for a business like her father’s in New Britain, which is why she picked the city, she told The Herald. Ortiz said she decided in 2016 that she needed more space for her business and bought the building on Arch Street. Ortiz said being a business owner is an everyday challange, however, experience has become her best friend. “I think that anybody that owns a business wants to have his or her own space, so that has been the best,” Ortiz said. “With a lot of hard work and sacrifice, we have been able to accomplish all that we have.” She also credited her dedicated employees with helping her build the bakery. Frances Rodriguez has worked for Ortiz for three years. Rodriguez said that when she’s at work, she feels like home, adding that the bakery has an excellent environment where everyone gets along. Borinquen Bakery offers customized cakes by appointment. The bakery also serves sandwiches, salads, pastries, and a variety of breads. The business is open Monday through Thursday from 5 a.m. to 6:30 p.m., Fridays and Saturdays, from 5 a.m to 7 p.m.., and on Sundays, from 6 a.m. to 4 p.m.
For more information or to place an order call 860-826-1019 or visit: www.borinquenbakerynb.com . Karla Santos can be reached at 860-801-5079 or by E-mail at ksantos@centralctcommunications.com. Posted in New Britain Herald, Business, New Britain on Friday, 25 May 2018 14:33. Updated: Friday, 25 May 2018 14:36.